The pudding is in the proof. Pudding is pretty thick and murky… the reasons for proofs and types of proofs can seem murky as well. You need proofs, as in you really need proofs. One of the most important things to understand is what type of proof you will need for any given project. We will discuss the different types of proofs and what to look for when proofing print and graphic elements. A little background on how proofs are made will help you know what types of proofs you need. Proofs are printed on large-format inkjet devices. At the best printers, these devices are calibrated to predict how the job will print. This is an important concept. The proof is not necessarily showing you the most accurate representation of your InDesign file… it is predicting how your file will look when printed on a specific press and paper. Your file whether it is on a Mac or PC is going to be output (interpreted) by a device. That device can be someone’s laptop running a browser if it is a digital project or a printed billboard/package/brochure/card that was printed and therefore interpreted by a RIP. Sometimes, but not always, a proof can be a dot-for-dot proof of your ripped file, but that’s a convo for later. Because the large-format device is calibrated for the paper it uses, you cannot choose the paper you want for a proof. You have to accept the paper for which the device is calibrated. If you want a proof on the actual paper the job will print on, you will sacrifice color correctness and resolution and it just generally will not work, unless the job is printing digitally. Blueline (brown line) A blueline proof is a low to medium resolution proof in color or black and white. This proof is trimmed, folded, and printed from the final file from which the plates will be made. Blueline and brown-line are terms that belong to a technology that became obsolete in the 1990s, but the terms are still in use. Other equivalent terms are: plotter, folding Epson, folded color digital proof, digital plotter or just plain digital proof. Contract A contract proof is the “best” proof for resolution and color. In some, but not all, cases, it is a dot–for–dot proof, which means you will get what you see right down to the halftone dots. This proof is on high-resolution paper. If your project involves multiple pages, ask for your proof in reader’s spreads. Otherwise, you may receive printer’s spreads (which is easier for the printer to do), and it could take a ton of extra time to compare printer’s spreads to an earlier proof in reader’s spreads. Soft Proof A soft proof is a proof viewed on a monitor. Not to be used for color. A PDF is a type of soft proof. Die Strike A die strike is a sample impression made by a foil or embossing die on the specified paper. This procedure may be done while another job is running, so whatever foil is “on press” may be used. Your printer should supply paper so that the die strike is on the paper on which the job will run. If you also want to see your foil on your paper, specify that so your printer can plan accordingly. That is a press proof and an additional charge. Press Proof The actual job on the paper with all finishing techniques applied for a limited quantity. Drawdown A drawdown is a proof of specified spot ink on the actual paper that will be used for the job. One-off A one-off is a proof of a job that will be digitally printed. Because it is being digitally printed it will be on the press and paper specified. In the case of a large format project, the one-off may be reduced in size or only a critical section may be proofed. You are going to need a Sharpie®, preferably red, or a similar permanent marker to make your notes and corrections on the proof. Gloss proofing paper is not receptive to many inks, but a Sharpie works very well. • What are your viewing conditions? Is your lighting color correct? 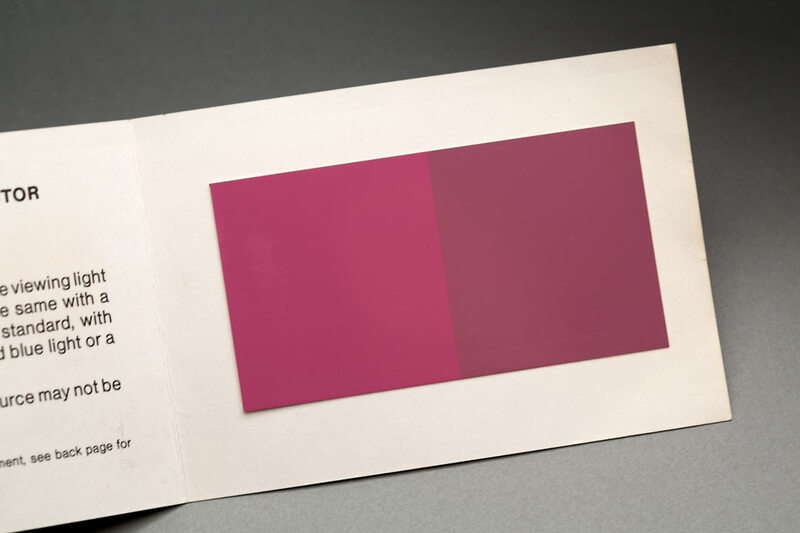 Use the lighting evaluation tool in your Pantone Color Bridge fan deck, if you have one or order a set of Pantone lighting indicator stickers. The photo below shows a RHEM indicator. This is a RHEM indicator showing that the light in which it is being viewed is not color correct. When the lighting is correct both halves of the rectangle look the same. • Are you at a viewing booth? Should you be? A viewing booth or viewing area is a color-correct environment. If you do not have the proper environment, go to your printer and use his. • Look closely at every piece of art whether it is a photograph, drawing, or logo. • Is the color off or correct? • Is the cropping correct? • Is the logo the correct version and/or usage? • Does the image look muddy or fuzzy? • Does part of the image look dark or muddy? • Does anything need retouching? • Was requested retouching performed? • Is text flowing correctly from column to column and page to page? Scan the last few words in each column or page, and the beginning of the next column or page to make sure the flow is correct. • Was the document spell-checked? • Are headlines complete without missing copy? • Is the document the correct size? • Are the margins as specified? Top? Bottom? Outer? Inner? Left? Right? Are the margins consistent? • Are the folios correct? Does the numbering start on a right-hand page? • Are there any hyphens or widows that need to be corrected? • Are columns correct and consistent, justified, or ragged? • Are elements that bleed cropped correctly? • Did the binding hide or cut off anything? • Is the backup, front-to-back orientation, correct? Triple-check this for two-sided postcards, business cards, or any item that changes reader/viewer orientation from front to back, outside to inside. See the two videos below for examples of head-to-foot and head-to-head orientations. • Is the size correct? • Is it the right paper(s)? • Is the color correct? • Is the weight(s) of the paper correct? • Is the paper’s finish correct? • Are the hash marks correct on the proof/dummy? • Do you have drawdowns? Are they correct? • If you are reviewing a PDF that was emailed to you or that you downloaded, print it out to size with bleeds and crop marks. Trim it, score it, fold it, and perforate it if necessary. (Having done all this, you will wish you had ordered a hard copy proof from your printer.) If it is a postcard and prints two sides, glue, tape, or staple it together. Is it head-to-head? Head-to-foot? Is the head-to-foot or head-to-head orientation in writing on the purchase order or on the estimate? • If you receive a hard copy proof, check it for trim, scoring, folding, color, imposition, backup, etc. Note that you should not be checking for spelling at this stage. • I do not recommend reviewing pdf proofs on a smartphone. I recently saw a pdf that looked different on two different phones. One showed the error, a key-line around a graphic, and the other did not show it at all. Needless to say, the job printed with the key-line because the client reviewed and okay-ed the proof from his phone. • Check the color carefully. Most proofing systems can now proof CMYK color very accurately. If the project is printing with a Pantone spot color, look at a chip or a drawdown and confirm it is the color you want. If the project is printing Hexachrome, HiFi or with touch plates, make sure you are at the press check. • If you are proofing via an online system, print the proof out yourself so that you will have a hard copy in your hands while you are looking at the job on screen. PHEW. That seems like a lot of stuff. 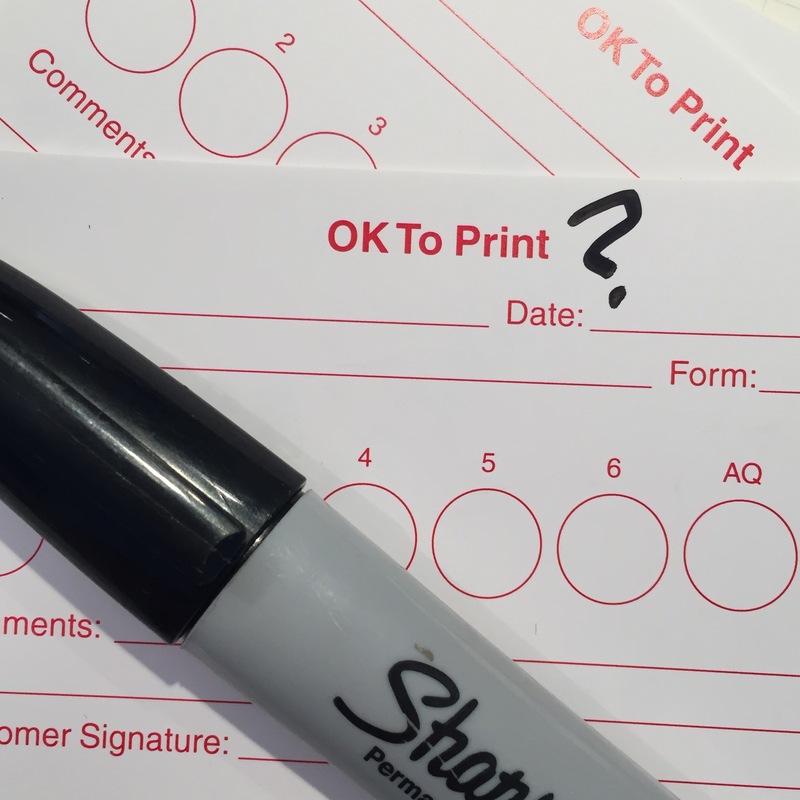 If you have a question about proofing or would you like me to further explain something, I’d love to know, comment or email me at marina @ designingforprint.com. Do you have a request for a topic for me to cover or elaborate on? Let me know! Really!